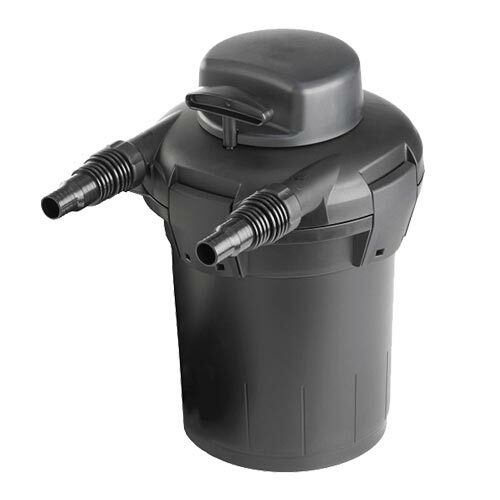 The pond boss® Pressurized Pond Filter with UV is ideal for use in ponds up to 1,320 gallons. This filter is easy to install and maintain and uses Ultraviolet Light Technology, combining 7 watt UVC with pressure, for maximum cleaning efficiency. The pressurized filter includes dual filtration pads catch large and small debris. The result, a clean pond with improved water quality that is safe for fish and plants to thrive. Plus, thanks to the “No Mess Maintenance” pull lever, it’s easy to maintain the unit without ever getting your hands dirty!